Is it just me......or are things on the change? I am sure I am not the only one to have felt the weight of indifference on my shoulders.......lack of motivation.......general slugishness.......of course, if it is just me then you'll be happy to read I'm announcing a full-stop! I'm not saying I've overnight turned into a cover model for some health and vitality magazine, or that I am about to be awarded 'Inspiration Guru of 2012'.....just that I feel a spark of anticipation.....not sure for what.....but hey, better than feeling lack-lustre.... un-sparkly! 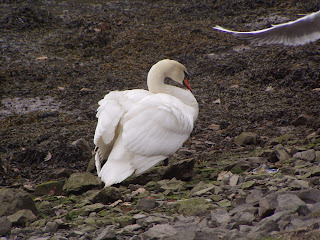 The weather has not been amazing this school hols, and actually as I type it is grey and rainy.......but on one of the nicer days this week, the boys, my mum and I went to feed the swans. After we came away, we passed many groups walking to where we had come from, laden with bags of bread. I have just acquired this lovely long shelf from my Mum and now have the perfect space to fit (some) of my fabrics and yarn..........there are boxes of things tucked away too, but this gives me something to be going along with. I do wonder if the recent spate of putting things away and organising has helped clear my mind a little too. If you want to see other Reasons for being Cheerful, why don't you head on over to Planet Penny's place! Also, wanted to say a big thank you for your lovely supportive comments on my last post, you are all a lovely, wise old lot! I Faith, you have a beautiful blog. Love your puppy and your fantastic photo of your family on the beach. So sorry about your sister, I have two friends with MS, it may not be as bad as it seems at the present. Medication is doing wonderful things these days. Thanks for joining in again. It must be the first hint of Spring which is putting a little sparkle in your day. I was brought up on the Norfolk Broads and swans were always a big part of the daily scenery, they are so beautiful. WOW, 10 weeks in sunny SA, lucky them. I do hope they have had a marvellous time. I must say that towards the end of this week I have been feeling a little un-enthusiastic and blah about things. I think not having a kitchen and dust EVERYWHERE has something to do with it!!! How good is it when you can feel the spark of change??? And every time I begin a sentence with and, I feel the exact same thing!!! 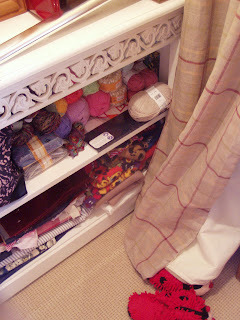 I like your new cabinate... there's nothing like a bit of re-shuffling and organising... especially of crafty bits and bobs! For me, there's a sense of excitement that comes with the lengthening days. Perhaps you're scenting spring. 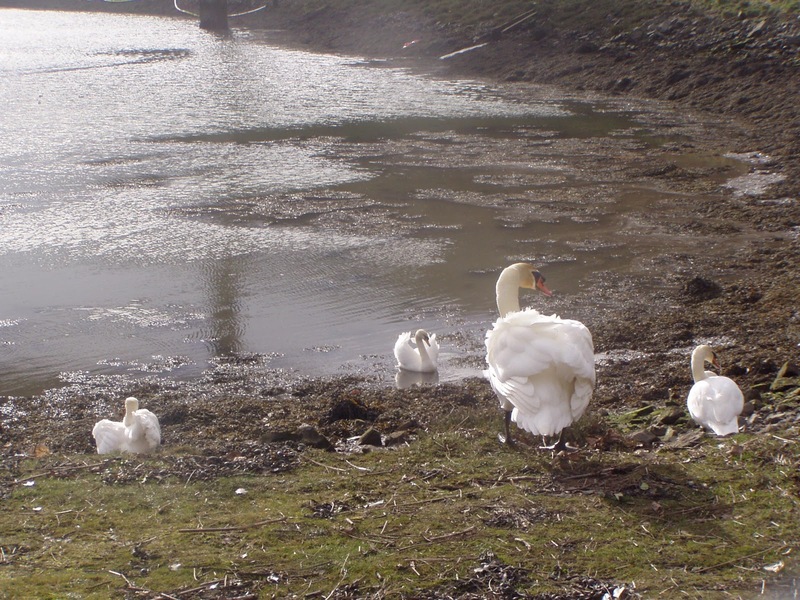 Lovely swans - and apparently well-fed. Have fun preparing for the returning in-laws. Lucky them! I used to work for a South African company and loved hearing about S.A. Though socially and politically a very difficult place, it sounds absolutely beautiful. I really know what you mean about lack of motivation! that has been me this week also! Like you I have put a stop to it. What lovely reasons to be cheerful tho. I love your new shelf and especially the content. lots of lovely things to look forward to, thats the way to go.